If you’ve been blogging for a while, then you probably have an email marketing campaign set up for your blog. Growing an email list has been proven to be effective in increasing website traffic and converting visitors to customers. Because of this, it’s important that your email campaign is relevant to your subscribers. You don’t want a huge email list with low open or click rates. Unfortunately, not all your subscribers signed up to your list for the same reason. Some might have signed up just to get the free e-book you promised, without any interest in reading the rest of your emails. Others might have signed up expecting to receive specific information. And the rest, well, they were probably just curious. It’s a brilliant tool for knowing exactly why a person visits your site, giving you the power to deliver content that is relevant to them based on their answers. 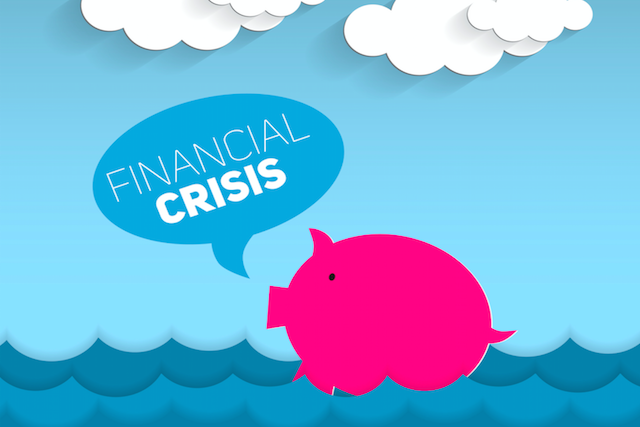 It’s simple yet it solves a problem that most e-mail marketing tools can not. RightMessage is branded as a website personalization software. 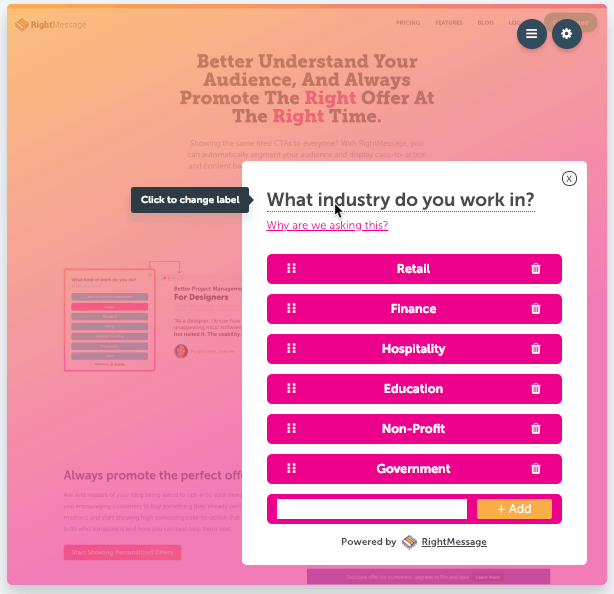 It installs a code in your site so it can capture answers to survey-type questions that you set up. 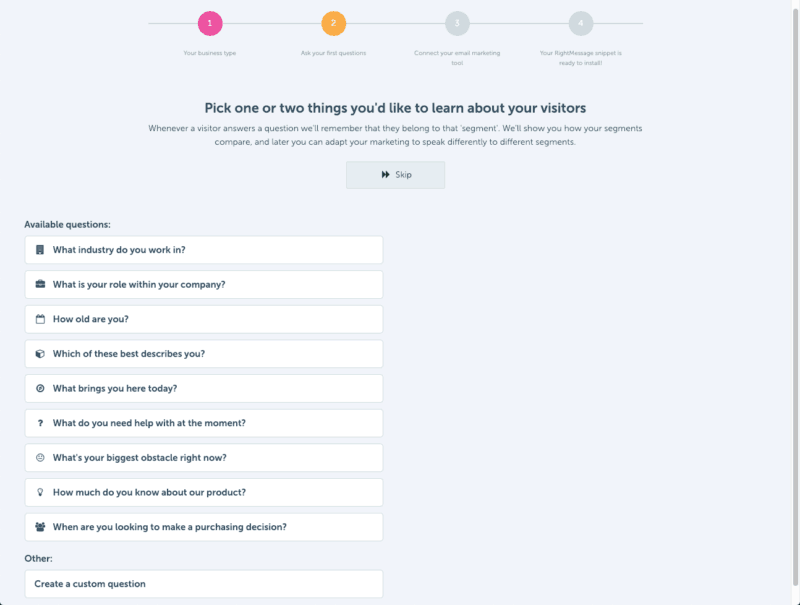 Once a visitor answers one or more of these questions, they are immediately added to a field/tag in your email marketing software. It’s a great way to segment your users. 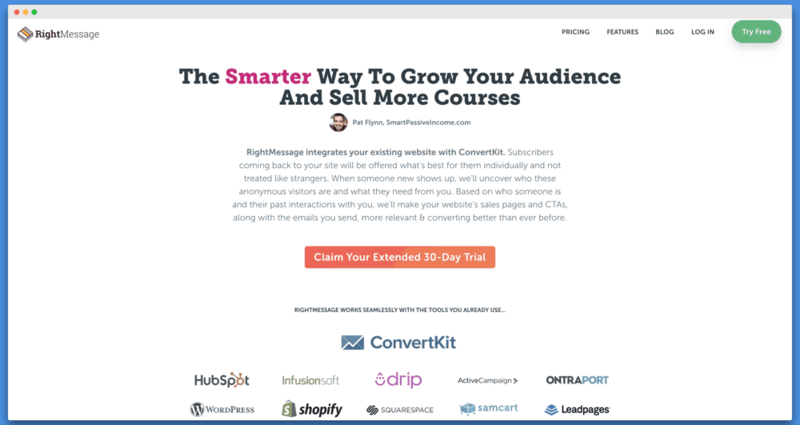 Especially if you are using modern email-marketing services like Convertkit, Aweber, Hubspot, ClickFunnels or any other, RightMessage is what you should also be using. Head to their website and you’ll see a testimonial from online entrepreneur Pat Flynn, claiming that this tool made him over $100k worth in customer sales. RightMessage works with any Content Management System including WordPress, Shopify, Leadpages, and Squarespace. When you sign up (they have a 14-day free trial), you’ll be taken through several steps. Choose a business type: Select what kind of business you are promoting with your website. This can be changed after the welcome phase. 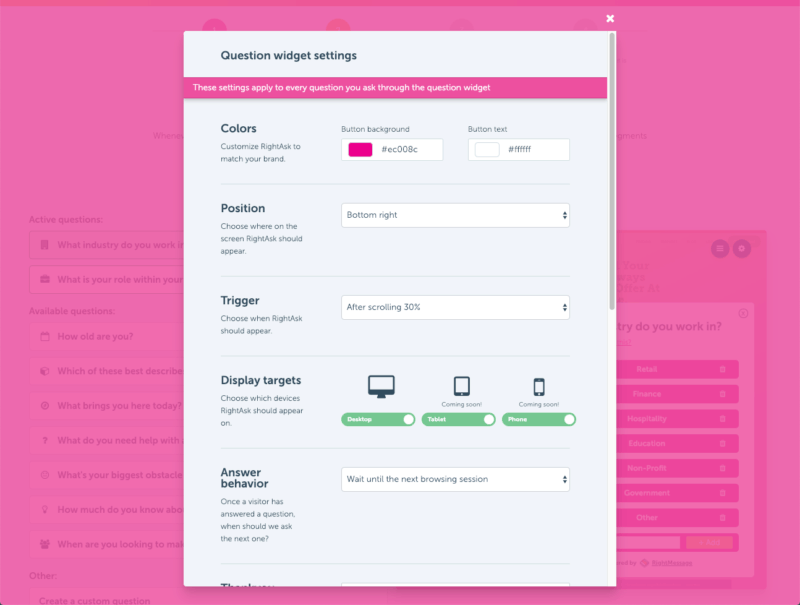 You can choose from a list of suggested questions or create your own. You are given a preview of the widget that will appear on your site. You can click on the heading to edit it, or click the Add button on the bottom to add more choices. You can also change the appearance of the widget by clicking on the gear icon on the top-right corner. In addition to changing the appearance, you can also change the widget position, the trigger (when the widget appears), enabling/disabling for mobile, etc. Now, it’s time to connect RightMessage with an email service provider. 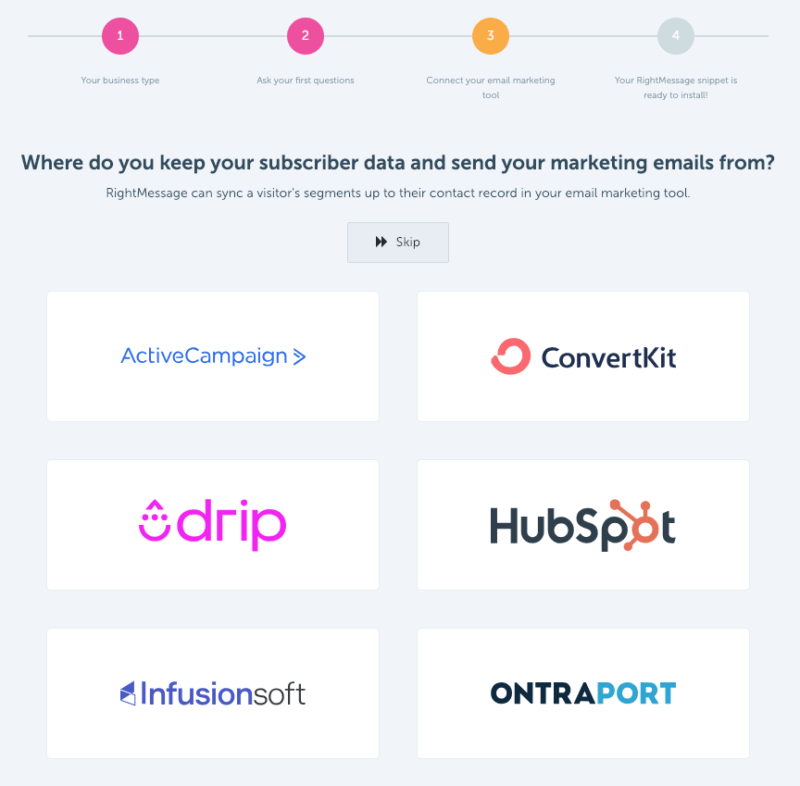 If you don’t see your email provider here, you can still use RightMessage’s data to learn about your site visitors and create a strategy accordingly. You’ll be given a script with instructions on how to add it onto your site. After verifying that the script is successfully installed in your site, you can publish your first RightMessage widget to your site. The dashboard will show you what steps you’ve done in the process. You’ll notice a Publish button on the top right corner and you’ll also see the questions you’ve set up. All you need to do here is click on the Publish button. 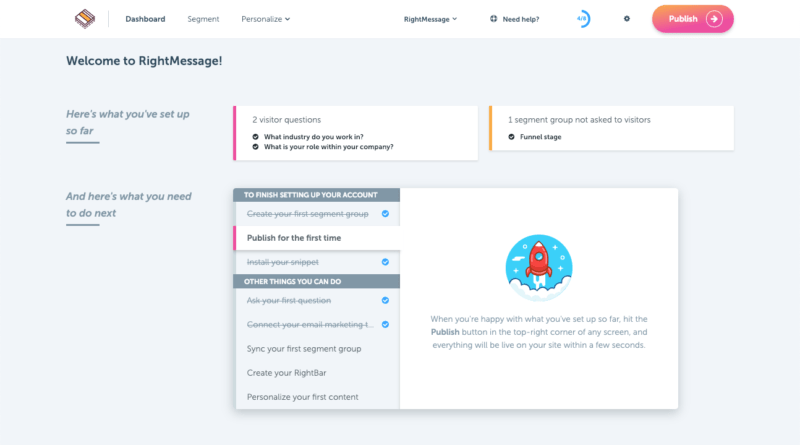 Depending on where you set it up and which trigger you chose, the RightMessage widget should be somewhere on the bottom of your site when it pops up. 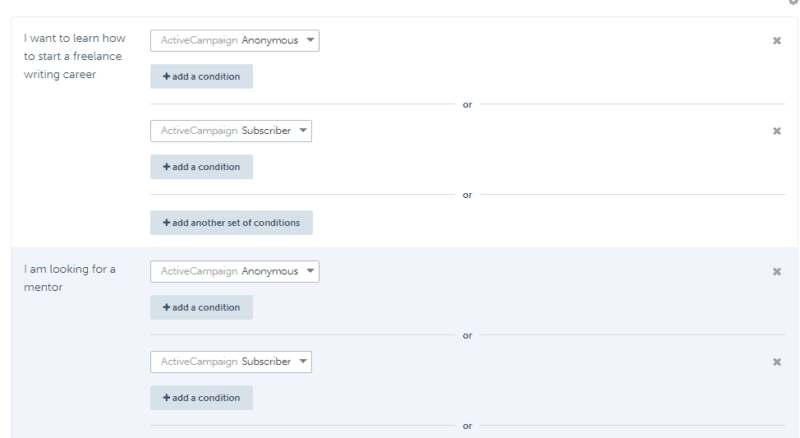 The most interesting (and rather technical) feature of RightMessage is connecting the data with your email list. 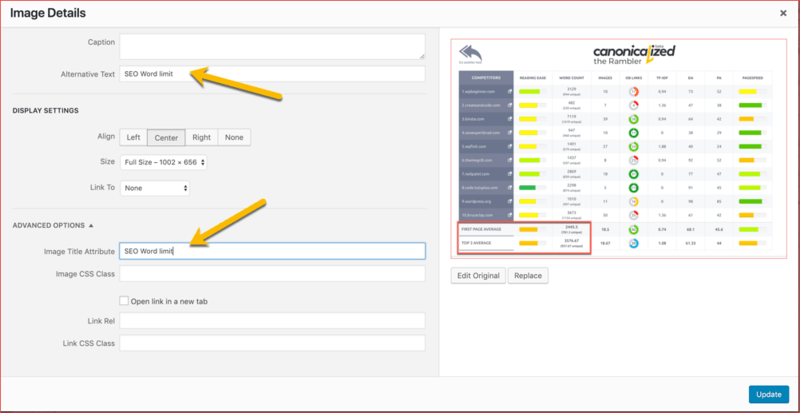 When a subscriber or visitor who later opts in your list answers one of the questions on the site’s widget pop-up, you can set up RightMessage so that it saves the information into the subscriber’s account information via a special field. This field can then be used to automatically put that subscriber into a segment based on his answer. As an example below, I’ve setup ActiveCampaign and created a field called Rightmessage to record my subscribers’ answers. 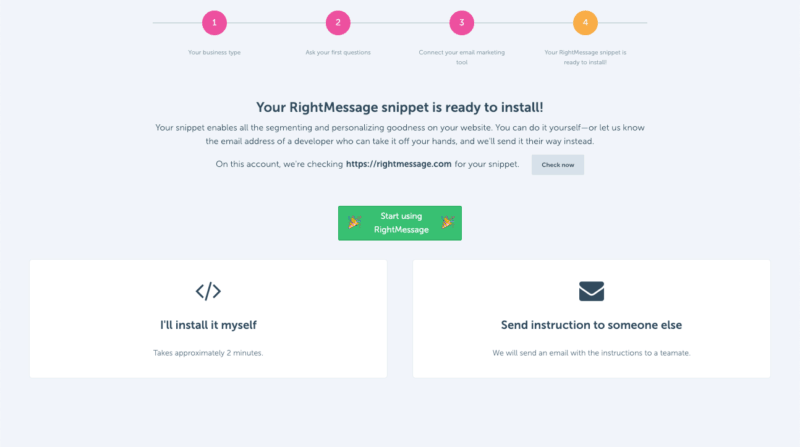 In addition to syncing subscriber data to your email software, RightMessage also lets you control who can see the widget on your site. These “conditions” are applied to each question on the widget. In the example above, anonymous or unsubscribed site visitors and subscribers can view the personalization widget on the site. You can also set conditions to a referring domain or URL, or if the visitor came from a different page of your website. RightMessage has a monthly and annual subscription fee which depends on the number of subscribers. Starting at 10,000 subscribers, you can sign up for the Survey Plan ($19/month), the Enrich Plan ($29/month), or the Personalize Plan ($79/month). Now that you understand how this tool works, you might be asking yourself if you need this for your website. There are more reasons why someone would want to use RightMessage, but these are the most common ones. 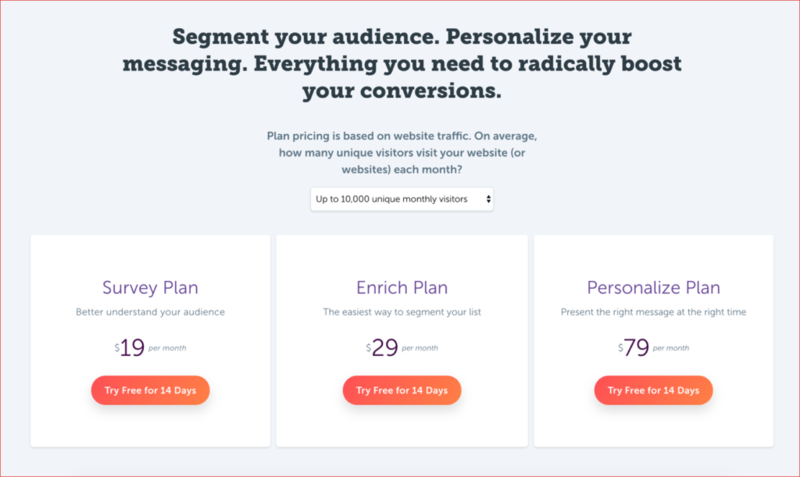 RightMessage is another useful tool that will help make your email strategy more personal — and less scripted. In a world where promotional emails all say the same thing to everyone, this software is a breath of fresh air. With that being said, it’s not a must-have tool, but it’s a nice-to-have. If you want to pursue a meaningful relationship with your email subscribers, then RightMessage can make that happen for you. Do you want to write SEO friendly content? 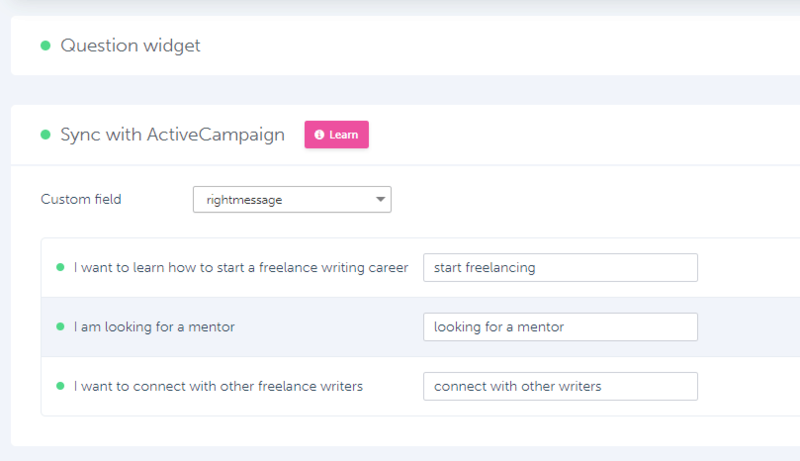 Well, this is an art which could take your blog or your writing career to the next level. 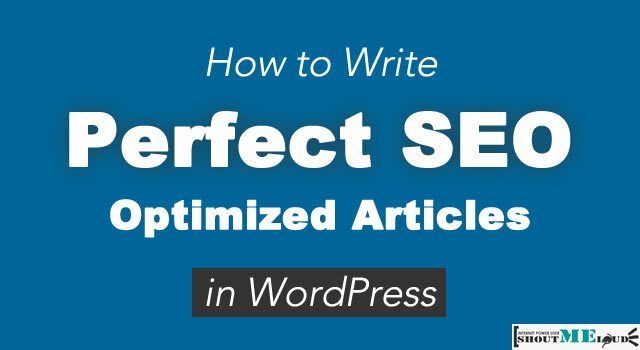 Anyone can write an article, but it takes special kind of practice to write SEO optimized articles. In this article, I will share some tips for writing SEO-optimized articles that will rank better in search engines. I run multiple blogs and we have several authors working day and night to keep these sites updated with fresh, quality content. Sometimes, however, quality can drop (which usually happens due to a lack of knowledge). Every blog post is like a web page in terms of search engine ranking and you can optimize each post with specific keywords for search engines. When writing these SEO friendly articles, there are several things that you should keep in mind. 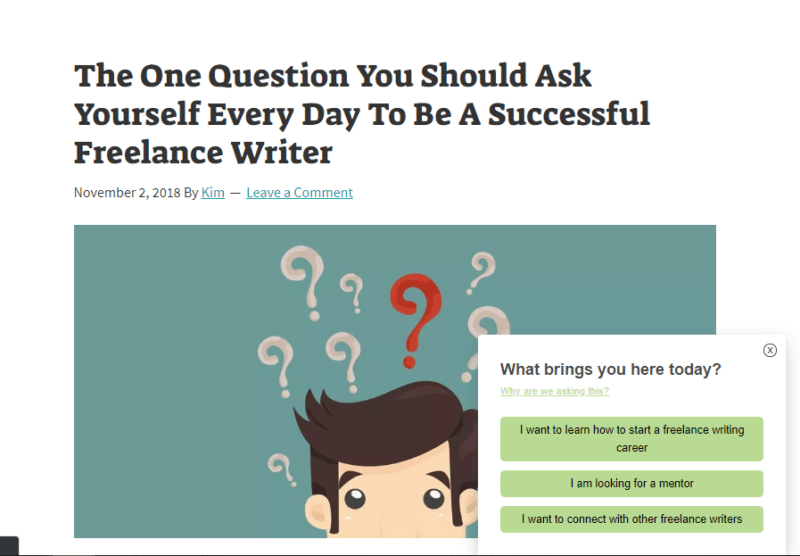 Whenever I hire a new author to work on one of our blogs, I have to give them manual inputs and checklists to help them to write better articles. Apart from selecting topics, there is a complete SEO checklist that must be followed. Also, note that in this post I will not be covering keyword research as keyword research requires a detailed post of its own. If you really want to make a difference for yourself or for your clients, without research, you are simply shooting in the dark. Do yourself a favor and get a tool like Ahrefs or SEMRUSH first. They both offer trial which will help you to do better research your topic and help in proper optimization of Keyword. These tools will help you to understand what is the right keyword you should be targeting. Also, put your target keyword in the Google search to see what kind of articles are currently ranking. This is part of the research and will help you understand what kind of article Google think is better for such queries. 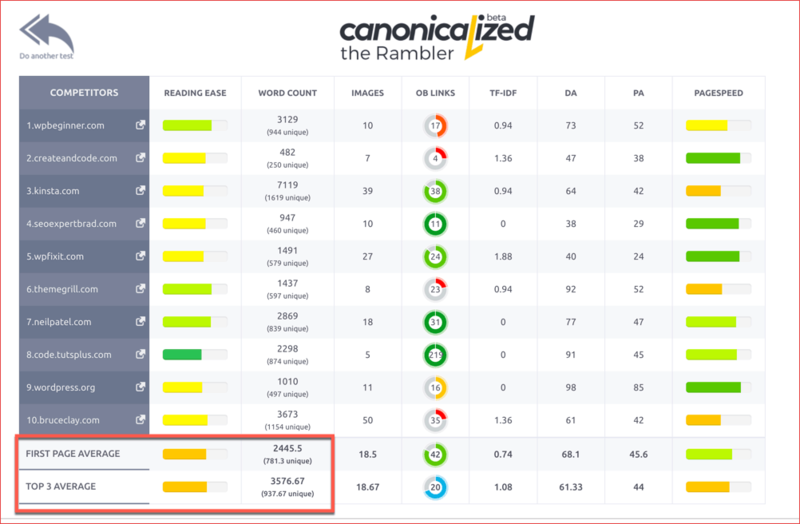 Use a free tool like SEO Rambler to identify what is the common length of articles that are ranking for your target keyword. This will give you an idea of how lengthy your article should be to stand a chance to rank on the first page. As shown in the screenshot above, the first-page average word for my target keyword is 2445 and average for the top three average is 3576. I would naturally ensure that my SEO optimized article should be at least 3600+ words. I have actually talked about this in-depth in my earlier guide on “Long-form content for SEO“. Alright, once we are ready with these data, now is the time to create an outline. Analyze the top 10 results for your target keyword. I know it’s a lot of tasks but again, SEO writing is not easy and so is ranking #1. Based on your understanding, create an outline of your content. It’s a good time to learn about brainstorm and outline from this free guide. Search for your target keyword in Google search and it will show a section called “people also ask”. Pick the questions that make sense with your article intent and answer them in your article. But, don’t stop here, as when you click on one of the questions, Google will add more questions after that. 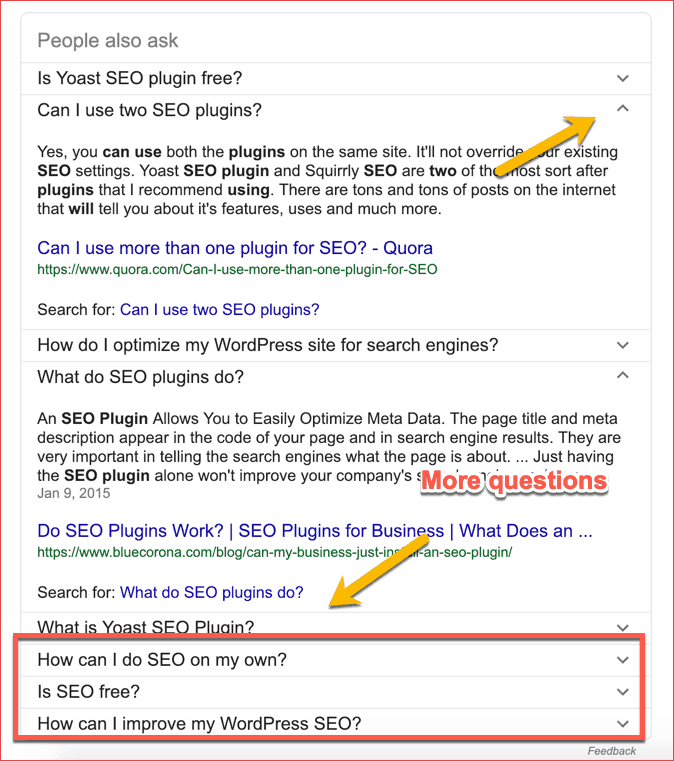 This is one smart way to ensure your SEO optimized content answers queries that people are looking for. Alright, now it’s time to start writing and optimizing your article for SEO. Now, I use WordPress as my content management system and even if you are using something else, the next tips on SEO copywriting remain applicable to you. If any perticular step doesn’t make sense for you, do check our comment section as it is full of useful questions and answers. First, you need to understand the difference between post title and meta title. Post title: How your reader sees the title of the post on your website. Post meta title: How search engines show your post in search results. If you have not specified a meta title in your SEO settings, your post title will be treated as the meta title. It is important to have your keywords in the meta title. Pro Tip: Keep your post titles less than 66 characters. 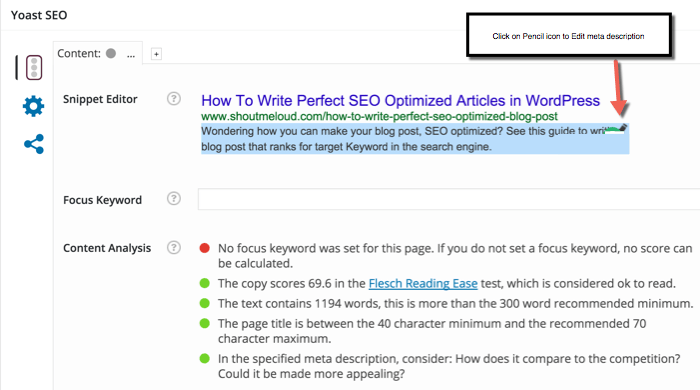 Every WordPress SEO plugin allows you to add meta descriptions to a post. These descriptions play a major role in search engine ranking. In 156 characters, you need to add your keywords and create a description that is seductive enough for users to click on it. If you have not added meta descriptions in the past, you should start doing it immediately. Make sure to add your main keyword in meta description and make it intent driven. Meta descriptions are very important. You should go back to any of your previously published posts which do not have a meta description and add one. By optimizing your post meta descriptions, you are ensuring that every post you write has the potential to drive a maximum amount of traffic to your site. Google sees every blog post as a different web page so you can rank every post for certain keywords. Meta descriptions are great places to put keywords. Text is how Google recognizes an image. To ensure that search engines can understand what an image is about, you must be sure to use proper image names. Many people make the mistake of uploading images with names like image001.jpg. When naming an image, keep the name relevant to the image itself. For example, if you take a screenshot of an AdSense dashboard, and you name the image “AdSense”, it will not be targeted. Instead, you need to use a name like “AdSense-dashboard”. This way, when people search for an image at Google Image Search, they will land on an image in one of our blog posts. You can always manually add alt attributes when you upload an image. I have seen positive results when using keywords in image anchor text ( and also when naming an image), so you should at least use keywords in your image alt text. When writing a new post, it’s always a good idea to link back to old blog posts so that readers will stick around your site for longer and also so that search engines can re-crawl these old posts. This helps in better navigability of your site which reduces the bounce rate- another important SEO factor. When you interlink, you should use the anchor text technique. 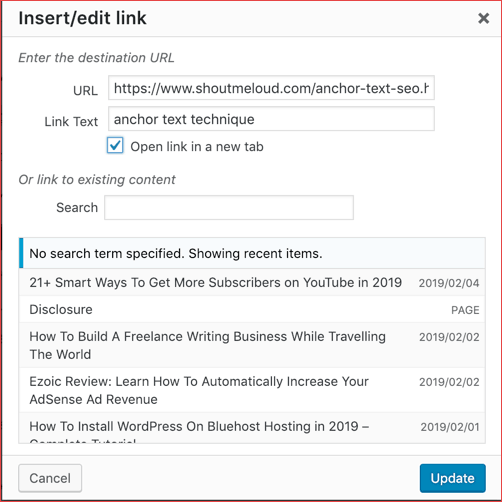 Simply put, when you link to a blog post, you see an option to add a link and a title. Make sure to fill out the post title with the main keywords for the post that you are linking to. At ShoutMeLoud, we also use a plugin called SEO Smart Links for automatic internal linking. Words like “a” “an” “the” and many others which are listed here are ignored by the search engine. Our post titles usually contain lots of stop words. “To” and “a“ are stop words in the example above. You can click on edit permalink and change the permalink to “blog-business-plan”, thus eliminating the stop words. Important Note: Never change your post permalink once the post is published. Using the right heading tags is another important aspect of SEO copywriting. Using proper H1, H2, and H3 heading tags. By default, in any SEO-optimized theme, the post title uses an H1 heading tag. So for the next sub-heading, you can use an H2 heading, and then an H3 heading, and so on. 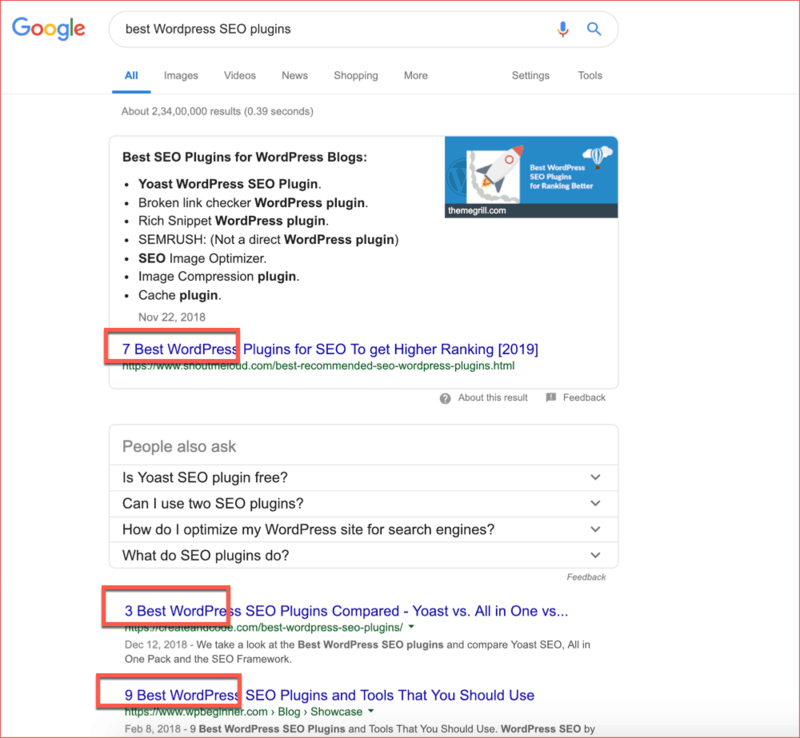 It is always a good idea to use proper heading tags for effective SEO writing, especially when you are writing a long post. Please refer to this post and this post for a better understanding of how to use heading tags within blog posts. According to the SEO community, it’s a good idea to use your keywords in H1, H2, and H3 tags. At the time of creating your outline (In the research phase), you should decide what your heading tags should be. Post title for readers & meta title for search engine (keywords in titles). Post meta description (optimize it for better CTR and use your target keyword once). Image Alt text (use keyword). Interlink within a post using good anchor text. Post permalink (remove stop words from permalink). Use proper heading tags (keywords in H1, H2, H3 tags). LongTailPro Review: The Best Keyword Research Tool? Let us know if you have any questions or if you have any other SEO writing suggestions. Share your thoughts in the comments section! Do you know someone who can benefit from the information in this post? Share it with them on LinkedIn or Twitter.